harveysbottomten: Does Bottom Ten Have East Coast Bias? With New Mexico State and Western Michigan suffering victories, the number of winless teams in the nation fell to four, or five if you count Georgia State, which may or may not really exist. No one is quite sure. Still, Lo Cal (1-7) remained atop the Bottom Ten amid speculation that the voters didn't want to be accused of harboring an East Coast bias. In past years, some Westerners have charged that Eastern voters didn't stay up late to see the really bad Pacific Coast teams on television. As the Bottom Ten has stated many times, this charge is patently false because BT voters watch few if any games. Down South, an Alabama restaurant displayed some advice for No. 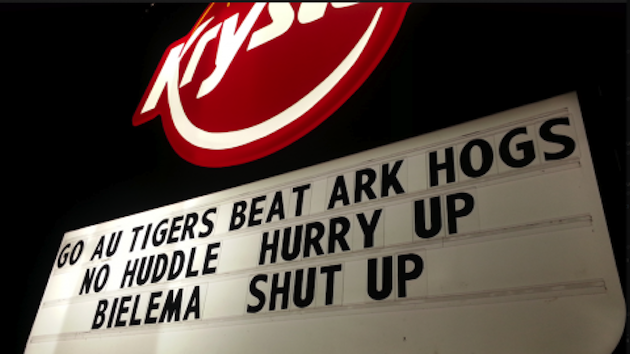 20 Arkansas coach Bret Bielema after he accused Auburn of sharing game films that were missing Tigers' plays (see photo below). In fact, Bielema was skeptical of the authenticity of the films in general after one of his coaches pointed out that they showed flag football scenes. 11. Texas at Hail Mary Paso (1-6); 12. Idaho (1-7); 13.Virginia (2-6); 14. W. Michigan (1-8) and E. Michigan (1-7); 16. Temple (1-7); 17. Memphis (1-6); 18. Idle; 19. Kansas (2-5); 20. Arkansas (3-5). Rout of the Weak: Ohio St (8-0) vs. Purdon't (1-6). Crummy Game of the Weak: Iowa State (1-6) vs. Kansas State (3-4). A "Walking Dead" convention for fans of the cable zombie show is set this weekend in Atlanta. "We'd have guessed Jacksonville," wrote columnist Dwight Perry of the Seattle Times. "It's the Jaguars' bye week." The fans needed a bye week so they could concentrate on finding paper bags to wear over their heads at games. Yes, Jag (0-8) booers have brought back a tradition started last century in New Orleans, where the home team was known as the 'Aints. Jacksonville fans call themselves the "Baguars." Some post messages on the bags, such as this reference to billionaire owner Shad Kahn: "I Got Kahn-ed. "Another pleaded, "Where's My Beer? "_a reference to an offer the team made a few weeks ago to give two free beers for every ticket of $45 or more purchased for a game against the Colts. The Jags lost, 37-3, but most fans didn't notice. Forbes magazine, by the way, ranks Kahn the 490th wealthiest person in the world. By coincidence, the Jaguars are ranked the 490th best team in the NFL. 7. Houston (2-5); 8. Philadelphia (3-5); 9. Cleveland (3-5); 10. Dallas (4-4). Rout of the Weak: Seattle (7-1) over Grampa Bay (0-7).